Plants are 6 to 8″ high when used as a groundcover but can climb to 90' as a vine. English Ivy (also called Common Ivy) is one of the most adaptable of all ‘groundcovers.’ This means that it is often used to cover bare places of ground and is dense in its nature of growth. With a habit that most often chokes out competing plants and weeds, English Ivy is excellent in preventing soil erosion. It is particularly useful where little else will grow. It is also commonly used as a decorative addition for buildings (however this application should be used sparingly as the vine can damage edifice surfaces). This means that it is most often used to grow on sections of buildings, walls, and fences for its aesthetic beauty. 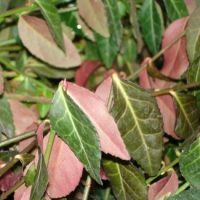 The glossy dark green leaves are evergreen and retain their color year round. 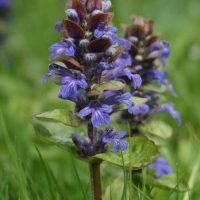 This ‘groundcover’ can grow in shade to full sun. It grows to be 6-8 inches high when used as a ground cover and can climb to 90′ feet or more as a vine. 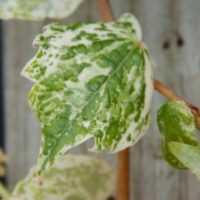 English Ivy grows fast and transplants quickly. It thrives in full sun or heavy shade and particular pretty on trees. More planting instruction can also be found at boydnursery.net/planting/. Leaves: Leaves are simple, evergreen, and alternate. Juvenile shoots are 3 to 5 lobed, 1.5 to 4″ long, and about as wide. They are dark green, lutstrous, and have whitish veins. Size: 6 to 8″ high when used as a groundcover; can climb to 90′ as a vine. Habit: Low evergreen groundcover, rooting at the nodes, or a high climbing, true-climbing vine attaching itself to structures with root-like holdfasts that may do DAMAGE to edifices. Flowers: Perfect, only occurring on the “Adult” form, greenish white, borne in globose umbels, September-October. Diseases & Insects: Bacterial leaf spot and canker, leaf spots, powdery mildews, aphids, caterpillars, mealybugs, scales, and two-spotted mite: mites and leaf spots can be serious. Landscape Value: Groundcover with many uses; good in heavy shade, can look especially nice when given proper cultural conditions; has a nice effect when grown on trees or buildings; the adult form develops high up in trees or on buildings; the leaf morphology of the adult form is different from the vigorous normal type and the plant becomes quite woody. Soil Preference: Best in deep, soft soil with an elevated drainage. Care: Prune regularly to keep within bounds. Be diligent in limiting growth on architecture. Fertilization: Act at the end of the winter, or in autumn, adding some manure, or a slow release fertilizer to the ground. In the spring, add fertilizers rich in phosphorous in nitrogen.